Leaving the track, off to Norman Park. 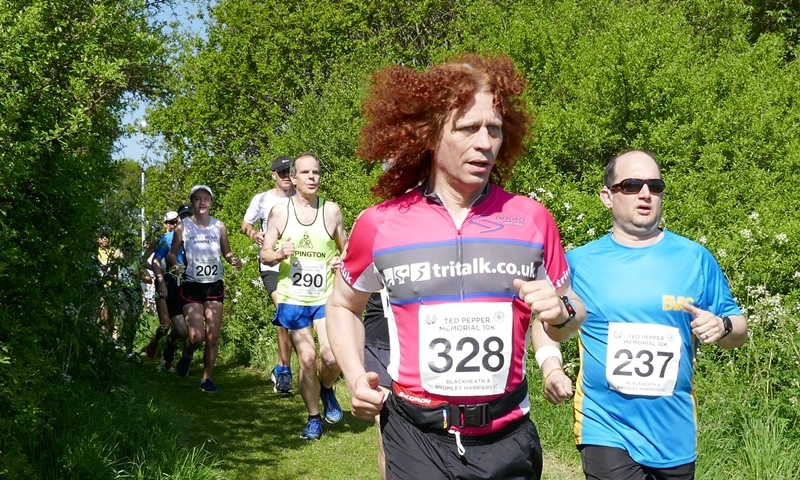 I don't really know why I've taken up running again and I'm not entirely sure why I'm on the start line of the 40th running of the Ted Pepper Memorial race. Ten years ago I gave up triathlon because I kept getting ill, coughs and colds over and over, and for a long time I didn't manage to do a decent spell of training so my enjoyment of the sport took a tumble. In the end I decided to have some time away from the sport and recover fully from whatever was going on. It seems in the blink of an eye ten years passed and it's now May Bank Holiday and we're at the athletic track in Norman Park getting a race briefing from the Blackheath and Bromley Harriers President, Paul Byfield. Andy Tucker, from Bromley Parkrun, set us off and we had an initial one and a half laps of the track to do before venturing out into Norman Park and then on to Hayes Farm. I'd done a few rehearsal runs and knew if I held 5:15-5:30ish minutes per kilometre at the start I'd be able to hold that pace and possibly speed up once we were in the last couple of kilometres and back to Norman Park. I have a terrible habit of starting much too fast and blowing up so initial pacing was important (I think my legs can still remember how they used to run but the rest of me can't keep up with them). But I also know I'm rubbish in warm weather, I was probably as fit as I'd ever been for a race in Austria in 2006 but the sun came out and the temperature hit 35 degrees and I left the race in a pile of sweat halfway around the bike leg. Today wasn't that hot but it must have been mid 20's and as I'm new (again) to running my resistance to heat is very low. Tracey making it look easy. I did 5:11, 5:11 and 5:19 for the opening 3k's but once we got to the drinks station in the fourth kilometre my energy had already gone to the heat and it was damage limitations from then on. As I walked under the shade of some trees to cool off (and surprised at how many people asked if I was OK, lots of good people doing this race) I contemplated my athletic journey to this point. Michele had joined the autumn BVAC Zero to 5km course and talked me into doing the same Parkrun she did as a graduation; "You might as well, you've got to drive me to the event so you'll be there anyway". In early December when it was cold and gloriously refreshing to run I did my first ever Parkrun and met a lot of the BVAC people, it seemed like a lot of fun. At the water station I'd tipped two cups over myself and that had cooled me a tiny fraction of a degree, enough to get running again. I got all the way around to the Soggy Bottom (the last of the mud left by the wonderful cool refreshing glorious rain that had fallen the weekend before) and had to walk again, there was no shade around this part of the course. HOT. Not such a bad place to walk, to be honest, it was quite rutted from tractor tracks and uneven. At the end of that section you get back to the drinks station where the outbound runners cross over with the homebound runners and I didn't see Charlotte or Michele so I assumed they were having a good run and already past that point. The autumn Zero to 5k group stick together, Charlotte had entered the Ted Pepper race and that means Michele had too because they support and encourage each other. As I was going to be at the event anyway, I was told, I entered because of "all the fun we were going to have". Obviously, all this fun was scheduled before it turned out to be so BLOODY HOT. I managed another jog on the way back to Norman Park but got caught by Leo by the fishing lake and then used him as my marker for the rest of the race, I'd run to catch him up then walk until he got ahead then catch him up... That seemed to work quite well until he put in an eight second final 100 meters to finish in front of me and good for Leo, he'd done a solid race and managed, somehow, not to melt. There was a lot of BVAC support at the finish area and it was good to see and hear them. 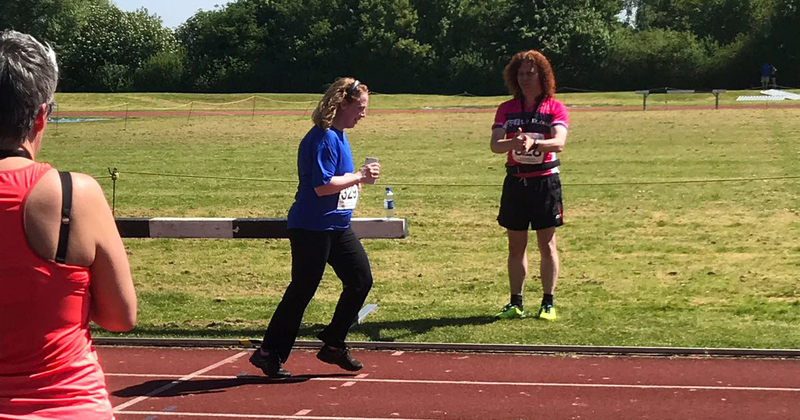 After collecting my finishers medal, presented by President Paul Byfield, I headed back around the course to collect Michele who was also struggling in the heat but got home to finish her first ever race - ever! 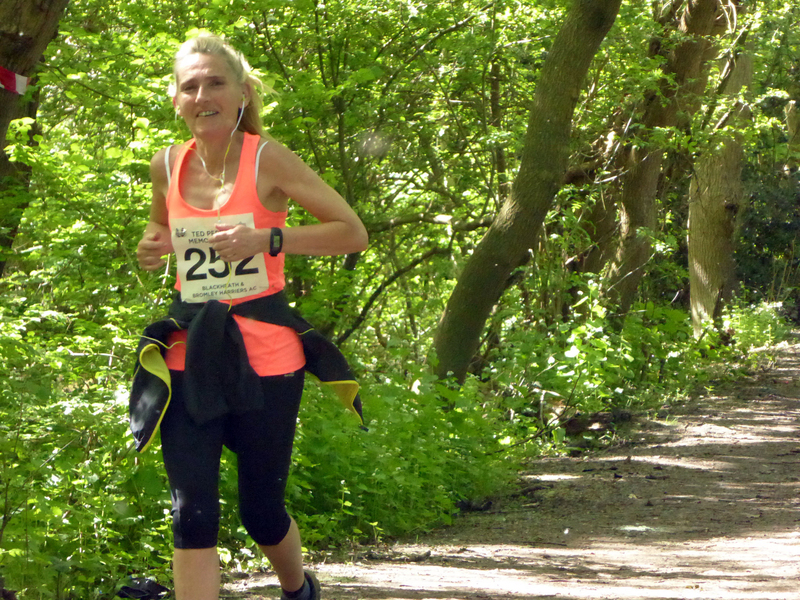 I didn't have the run I wanted and finished about eight minutes slower than target (chip time: 58:50) but with such a high BVAC turnout (and a high turnout of Well Wood Runners) to support and a sunny Mayday bank holiday in our lovely part of the world, I enjoyed the day. Now, I wonder where I left my old training plans! Full results and more pictures here: Blackheath and Bromley.